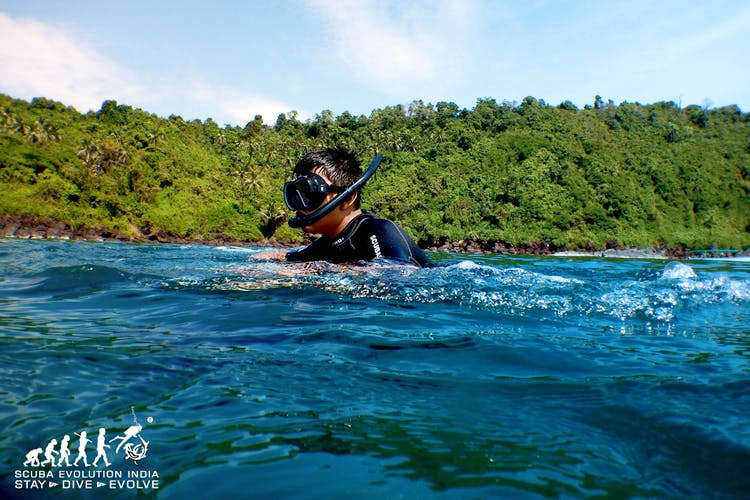 #DareDiveDiscover: Explore Underwater With These Scuba Diving Professionals! Always wanted to learn Scuba Diving? Gone are the days of waiting for enough bank balance to plan a trip to Spain, Dubai, Thailand or Australia! Now all you need is a holiday in our very own beach paradise - Goa! Introducing Scuba Evolution India - a company providing premier dive experiences in Goa, who have been helping new divers explore the underwater world in a safe manner while constantly working towards protecting the marine life. Whether you’re someone who wants to test waters or who wants to dive deep into the sport with various levels of certification or become a pro - these guys have got you covered! Not just that, they also provide you with all the required scuba gear and recommend accomodation for a safe adventure as you explore the beautiful Goan waters. It's about time we move on from all the parties and shacks and hit the sea! Whether you’re a 10 year old or a 50 year old - they’ve got special courses for every one of the age 8 years and above. Their courses are divided into 3 main categories - Discover Scuba Diving, Introductory Courses and Advanced Courses. Depending on your age and requirement, you can opt from over various courses per category starting at INR 3000 per day for kids (8-10 years – PADI Bubblemaker course) and INR 18,000/22000 for Introductory and Advanced courses. However, everyone can dive! If you’re a certified diver, you can opt for a Fun Diving and discover wrecks around Grande Island, go through an underwater channel, or just dive to watch corals and tropical marine life. If you’re an advanced diver who’s looking at a professional diving career, then you might want to check out their PADI Dive Master Professional Course, which could be completed in anytime between 20 days (if you already have all the other prerequisites in place) - 3 months. And you can also enroll for their PADI Instructor Development Course, beginning soon. You could also choose to become Technical divers going beyond the recreational with their PADI Tec Rec courses. Basically, there’s something for everyone! So next time you’re planning a trip to Goa and you’d love to try some underwater experience, don’t forget to hit these guys up! The first and most important emphasis of Scuba Evolution India is every diver’s safety! From masks, wetsuits to other important life-saving Scuba equipment, they’ve got you covered with quality gear from head to toe. The instructors will ensure that you’re aware of all the necessary training and safety tips before you take your first dive. It definitely helps to know that Scuba Evolution India is the brainchild of Commander Skandan Warrier, a veteran Naval Officer who has served in the Indian Navy as an aviator and later on ships, with vast experience in operations at sea. Needless to say, his years of experience just add on to the trust and safety factor for everyone taking any course. Check out their website to know more!